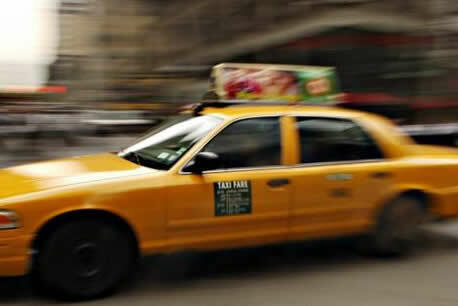 New York cabbies are an eclectic spread of American minorities, each a little quirky and with a story to tell. Often, as you exit the JFK terminals, hours of cabin fever give way to cab-angst. My flight had been smooth, arrival in New York sluggish (believe it or not, the US Immigration's computers were down) and stepping into the cool morning air a relief. Despite the grey drizzle, the dispatcher was chirpy and getting a taxi was remarkably painless. My chauffeur for the morning was an elderly African American fellow. I couldn't initially ascertain if he'd actually woken up before taking the wheel. His slur and half-closed eyes belied the verbal torrent that was about to greet me. But, that's how the New York cabbies work. Each has something to say. "Ya gonna tha' syngog by the cemtry?" he wanted to know. Once I deciphered his question, I was impressed that he had identified me as a Chabadnik and knew exactly where to deposit me. For ten minutes en route to the Rebbe's resting place, he rambled on. I understood about a third of what he had to say. Apparently, I got the meaningful bits. At some point, for some unknown reason, he started discussing people who hate other people. His outlook on the subject was simple. And bull's-eye. "Ya gotta 'member you're just a pile of dirt. A pile of dirt!" He swiveled back to see my reaction and mistook my horror at his almost hitting another car for admiration. "Now, thinkaboudit- wouldya git angry at a pile o' dirt? If you held sand in ya hand, couldya hate it?" There it is: Real-life wisdom, distilled in endless circuits along busy city streets. It's an overcast Wednesday morning, I'm on the way to the Rebbe and the taxi driver is sharing Chabad teachings. People only hate people when they take themselves, and each other's foibles, too seriously. Let go of some ego and people don't get in your face that much. About 100 years ago, a Chosid came to the third Lubavicther Rebbe (the Tzemach Tzedek) to complain. He argued that his fellow Chassidim "walked all over him" every time he entered the Shul. The Tzemach Tzedek's reply: "Don't try spread yourself over the whole Shul and nobody will step on you." "Let my soul be like dust to all", we intone at the end of the Amidah. Our forefather, Avraham, was first to say it: "I am but dust and ashes". Avraham didn't hate a soul. He defended the undefendables of Sodom and Gommorah. Humility is the vaccine against hate. What would you do for "The Cause"?